We are not able to accommodate same day registration. Preregistered riders only. We apologize for the unanticipated change. We have capped registrations to the capacity of our volunteers to ensure a quality event. Please consider volunteering to help the event grow so we can have more riders next year! Ride check in is located behind (east) of Oggi's. Please park in the parking lot behind the restaurant (same place as check in) so we do not interfere with open businesses. Bathrooms can be found at the Burger King or gas station in front of Oggi's. - DO NOT take your bikes in the gas station or restaurant - have a friend or the registration staff keep an eye on it for you. Choose from one of three distances on registration. 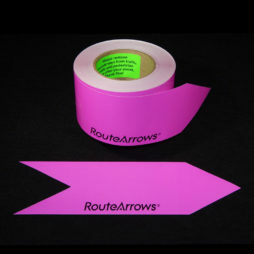 Routes will be marked with route arrows - purple for the 50, blue for the 67 and green for the 100. Routes as shown here are subject to change as we finalize things before the ride. You will be provided with a route sheet the morning of the ride with a map and turn by turn directions. There are riders and drivers on the course to provide roving support. You can call for help if you need assistance during the ride. Phone numbers for support will be on the cue sheets. There will not be any road closures or law enforcement to guide traffic. You will have to follow applicable laws regarding bicycles.